Regarding my constant look at the coverage of Italian wine by The Wine Spectator, it seems there is some good news and some not-so-good news. Let's start with the good. Bruce Sanderson took over the job of writing about Italian wines for the magazine recently and from what I've seen so far (admittedly a small sample), I have to congratulate him on his views. In the November 30 edition, Sanderson rewarded the small estate of Cascina Roccalini in the town of Barbaresco with some very high scores, with the highest rating being a 93 for the winery's 2008 Barbera d'Alba. I tasted this offering at the winery this past May, thanks to the US importer Terence Hughes, who set up my appointment after I expressed interest in trying these wines, which I had read about on his blog. I loved all the wines from Cascina Roccalini, especially this Barbera, which is an amazing wine (see the post from my other blog). The wines have great varietal purity, impeccable balance and beautiful structure. This is certainly a combination of several factors, including the viticulture of owner Paolo Veglio as well as the superb winemaking of Dante Scaglione, best known to Italian wine lovers as the former winemaker for Bruno Giacosa. As you might imagine from his previous work, Scaglione makes wines in a traditional style; that is to say, wines aged in grandi botti, large casks as opposed to the small French oak barriques. Many wine writers have joined me in my preference for traditionally aged wines from Piemonte, as they best express a sense of place instead of emphasizing a dark color or a the obvious sweet and spicy notes of small oak. Readers of this blog know of my disdain for the previous individual who covered Italian wines at the Spectator. Suffice it to say that he clearly preferred modern wines made in an international style. Like what you want, but do your job and give credit to those vintners that continue to make wines that represent their heritage. There are just too many internationally-styled wines out there today. We all expect a different style of cuisine when we go to Italy - we don't go there to have a hamburger (or foie gras, for that matter), so is it too much to ask that producers in Italy continue to be honored for their traditional views? That they should be rewarded for making wines that are singular and not aimed at following a trend? That's the good news. Now for the bad and I'll keep it brief. The Spectator has recently announced its Top 100 wines for the year, what the publication labels as the "year's most exciting wines." There are exactly nine wines from Italy that made the list. Now while I think there should me more than nine, I won't criticize them for this; let's face it, there are impressive wines being produced in many countries these days, so they need to let their readers know about them. But it's the choice of wines that irks me. Of the nine wines, seven are from Tuscany. Seven of nine! You'd think this was the only region in Italy that produced notable wines (the other wines - one each - are from the Friuli and Veneto regions). Nothing from Piedmont? Nothing, especially given the new releases of 2006 Barolo and 2007 Barbaresco? Nothing from Sicily, Campania, Alto Adige, Lombardia or Umbria? This proves to me the lack of balanced coverage of Italian wines by the magazine. It seems as though the old administration at the magazine may have had a lot to do with this list, as a few of the wines that made the Top 100 from Italy have been represented before. Yes, there are some new entries here, but again, the list is just a dull one. Let's hope this year is the last time the publication selects such a poor representation of Italian wines. I hope that's the case, but I'm not betting on it. Reading through Joseph Bastianich's latest book, Grandi Vini: A Opinionated Tour of Italy's Finest 89 Wines (Clarkson Potter, New York, $24.99), is almost as rewarding as sitting down with a winemaker at his cellar or home in Italy and tasting one of his finest releases. You're not in Italy, but you might as well be, given the author's insights combined with his mixture of history, personality and elegantly simple wine descriptions. Bastianich is one of America's foremost authorities on Italian wines and only someone who has studied this subject for so long could write a book as valuable as this. He currently owns more than a dozen Italian restaurants in New York City and also owns wine estates in Friuli and Toscana in Italy. He grew up working for his parents (everyone knows his mother Lidia) at their Buonavia Resaturant in Queens and then moved on to embrace Italian wines with the help of a nearby wine retailer. Bastianich was able to travel to Italy, at first with his parents and then on his own and it's clear from this book how enamored he became with the country, its wines and foods. Grandi Vini is more than just a listing of dozens of great wines (though it's an impressive list), it also serves as a travelogue across the Italian peninsula, giving the reader a look into the complex and fascinating world of Italian viticulture. The famous wines and producers, such as Ornellaia, Sassicaia, Biondi-Santi and Gaja are listed as you would imagine. But what I'm most impressed with are the lesser-known wines the author has included, wines that deserve much more attention than they currently receive. These include such outstanding wines as the Giuseppe Rinaldi "Brunate -Le Coste" Barolo, the Fontanafredda "Lazzarito -La Delizia" Barolo, the "Monte Fiorentine" Soave Classico from Ca' Rugate and the "Vorberg Riserva" Pinot Bianco from Cantina Terlano in Alto Adige (I must admit that I'm thrilled to see these wines in the book, as the are all personal favorites of mine as well). In case you're one of those wine lovers that only thinks of Italy for its big reds, such as Barolo, Brunello and Amarone, you'll love learning about its notable whites from Friuli, Marche and Campania among others as well as gorgeous reds such as Taurasi, Vino Nobile di Montepulciano and Gattinara, to name only a few. Of course, there have been many fine books that have documented the story of Italian wines, so this is not groundbreaking material, but perhaps only someone as familiar with Italian wines and as passionate as Bastianich could have told this tale so eloquently. The book is titled as "an opinionated tour" and there are many valuable observations on specific wines and producers. Basianich notes how Edi Keber changed the history of Collio with the introduction of his Collio Bianco, a blend of several local varieties. He writes, "Edi and 80 out of 120 producers in Collio believe that a wine named Collio, crafted from historic and native varietals (sic), is the only future for this tiny border wine region making the best white wines in Italy and perhaps in the world." An even stronger opinion is revealed in the author's text on Bruno Giacosa, the famed producer of Barbaresco and Barolo. 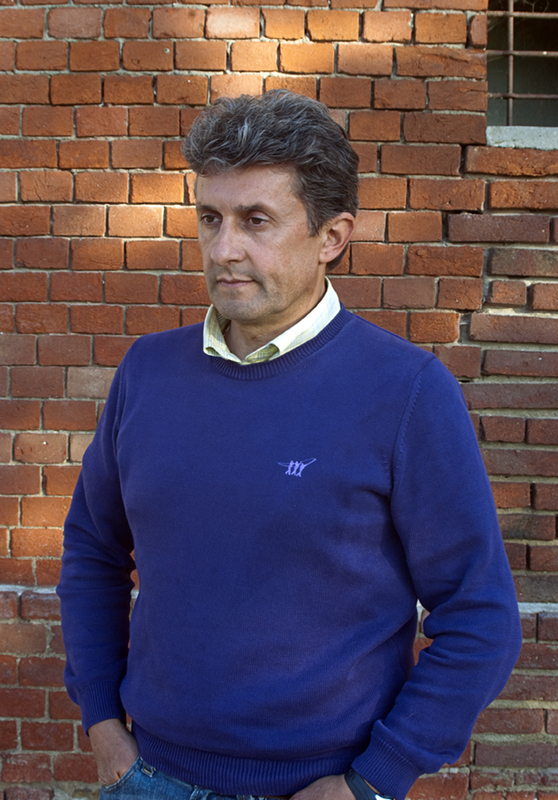 "Bruno Giacosa," the author writes, "has remained almost the only winemaker in Piemonte who is still able to make great wines with other people's grapes." Where else would you read a comment such as that? As for the chosen wines themselves, Bastianich has opted for a balancing act, as is the proper course for a book on the best Italian wines. Of course, Barolo, Amarone and Brunello are well represented, but there are also several examples of Taurasi, Soave and Chianti Classico as well as classical made sparkling wines from Lombardia and Trentino along with notable reds such as Nero d'Avola and Aglianico del Vulture. 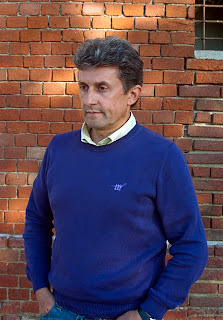 The style of the wines vary as well, from traditional to the more modern; writing about Barolo, the author confesses his love for traditional wines, yet also praises the ultra-modern approach taken by Roberto Voerzio. Finally, I love the writing style Bastianich uses for the descriptions of his wines. This is not a book filled with words such as "opulent", "austere" or "dramatic", but rather words that make these wines easy to understand. For example, discussing the Ca' Rugate "Monte Fiorentine" Soave, he writes, "In the mouth, the wine is round, juicy and elegant. Despite never having seen wood, this wine has body, well-balanced acidity and structure." This is a summary everyone can understand and given the enormous range of Italian wines in general, the author's decision to simplify things and not talk down to the reader is a welcome one. The combination of history, opinions and insights into particular producers Bastianich has met over the years makes this book a valuable entry in the Italian wine world. Highly Recommended. Over at Kyle Phillips's Italian Wine Review, the author has contributed an excellent post on the subject of Supertuscans (read here). Phillips, an American who has been living in Tuscany for several years, discusses a recent tasting of ten Supertuscans he attended and gives his typically thorough notes on the wines. He also lends a valuable lesson on the history as well as the meaning of these wines. Phillips points out the vagaries of Italian wine laws over the past 30 or so years, mentioning how some wines originally identified as Supertuscans - basically red blends that did not adhere to the strict denomination laws - could now be labeled as a DOC or DOCG wine, thanks to the changes in these categories (such as allowing Cabernet Sauvignon and/or Merlot in a Chianti Classico). So what is a Supertuscan, the author asks? 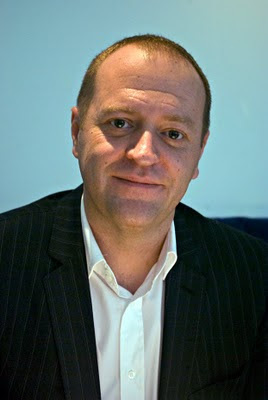 It is an important question, if not for quality's sake, then certainly for the sake of prestige and marketing. The answer is not as easy as you might imagine, especially when you consider the various approaches that individual wineries in Tuscany take when it comes to labeling their wines. For some the Supertuscan term is a helpful one, as it is a category they can use when they produce a wine that does not fit the DOC or DOCG requirements. 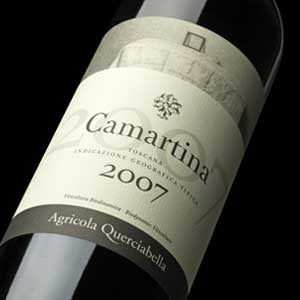 A great example of this is Camartina from Querciabella, one of my favorite Supertuscans from one of my favorite Chianti Classico producers. As this wine is a blend of 70% Cabernet Sauvignon and 30% Sangiovese, this cannot be labeled as a Chianti Classico, as that wine type must contain a minimum of 80% Sangiovese. Thus the wine is legally labeled as IGT Toscana Rosso (a big improvement over the old labeling of Vino da Tavola or "table wine. "); IGT may be its legal identity, but in reality, the wine is a Supertuscan. This is great for Querciabella, as the Supertuscan term denotes a special wine, not only in terms of quality, but also in terms of importance and limited availability. It's as though the winery is saying, this is our best wine (it is, along with their monovarietal Merlot called Palafreno) and we can take special care to make this a wine of the highest quality (and quite often a wine of the highest price range for any particular estate). As Querciabella also makes an excellent Chianti Classico, the winery offers both a DOCG wine as well as Supertuscans and the consumers have a choice. Then you have the case of Tignanello from Antinori, which was one of the first Supertuscans, as Piero Antinori used Cabernet Sauvignon in the blend (along with omitting white grapes such as Trebbiano and Malvasia, which were required until changes in the 1990s); at the time (early 1970s), Cabernet Sauvignon was not allowed in a Chianti Classico, so Antinori could not label it as such. 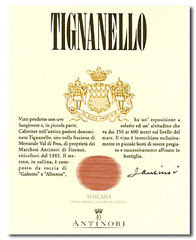 Yet recent changes in DOCG laws now permit small percentages of Cabernet Sauvugnon, Merlot and Cabernet Franc to be part of the blend, so Tignanello can today be labeled as a Chianti Classico, should Antinori choose that option (a typical blend for Tignanello these days is 85% Sangiovese, 10% Cabernet Sauvignon and 5% Cabernet Franc). So why does Antinori not label the wine as a Chianti Classico? In Phillips's words, "Tignanello is quite well enough known as it is, and calling it Chianti Classico would likely have no positive impact on its sales." I agree completely and think the author is on to something when he writes that "a Supertuscan is what a winemaker wants it to be." That may not fit neatly into wine laws, but it represents reality. These wines represent a philosophy, which is generally a winery telling us that this is a special wine that they believe doesn't fit neatly into one category or if it does, exceeds the typical quality of that category. Of course, some wines are by necessity categorized as Supertuscans, as they may contain less Sangiovese than is required; this may be a winemaking decision based on the weather, when the Sangiovese did not ripen properly due to cool weather or late season rains (perhaps a blend, let's say of 70% Sangiovese and 30% Merlot, thus not legally a Chianti Classico). In these instances, the Supertuscan category is necessary (though the category is in reality, IGT Toscana Rosso, as mentioned above). Then you have wineries that believe that they can produce better DOC and DOCG wines and eschew the Supertuscan category. These producers believe that Supertuscans are confusing for consumers, who better understand the historical importance of the Chianti Classico or Vino Nobile di Montepulciano name (among others in Tuscany). Thus their marketing and wine production revolves around a given and not a fleeting category. In the end, it's an interesting debate. Phillips has written an excellent post (which includes a brief history of Chianti Classico laws); it certainly gave me valuable insight as well as an incentive to express my own thoughts on this category. I'm certain this debate will continue for many years to come. A straightforward post today about some new wines I've tasted from Argentina lately. Malbec is still king of course, although Torrontes is starting to become a more important variety. Overall, quality is improving, as the mentality among many producers has shifted from mass production to a more limited scope, based on smaller production. 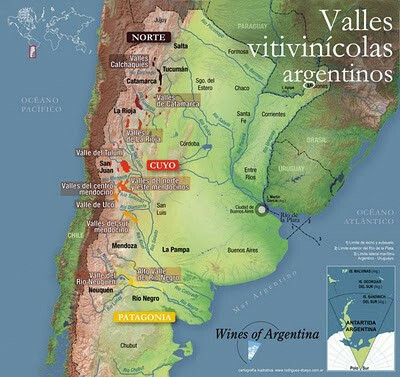 I hope we will soon see more varieties take hold in Argentina, as I believe they will need more than Malbec if they truly want to complete in the world market. Syrah, as evidenced by the Sietefincas bottling below, may be the answer. Although not planted in large numbers, Bonarda is being seen more often these days in Argentina; the grape was brought over to Argentina from Piedmont in northern Italy. Bright garnet, pleasing aromas of Queen Anne cherries and sage; medium-bodied with pleasing cherry fruit on the palate, soft tannins and tart acidity. An enjoyable quaffing red meant for lighter dishes (ideal with empanadas) - enjoy over the next 10-12 months. Nicely priced at $12. There is a strong Italian influence with this wine, which is fitting as the winery was founded in 1952 by Giovanni Vincenzo Pannunzio, an Italian immigrant. Bright ruby red with aromas of blackberry, plum and tar. Medium-bodied with rich spice and nicely balanced tannins and notes of dried brown herbs in the finish. This is quite reminiscent of a young Montepulciano d'Abruzzo. Enjoy over the next 1-2 years. Nice complexity for $17. Deep ruby red with aromas of sage, cinnamon and currant. Medium-bodied with very good concentration, this has an elegant entry on the palate. The finish offers very good persistence, bright acidity and subtle notes of dried orange peel, clove and Charismas spice. This is a beautifully made Syrah that goes for subtlety and finesse instead of taking the super ripe, powerhouse approach. If you prefer jammy Syrahs with deep purple color, look elsewhere – I’ll go for this style almost every time. Enjoy over the next 2-3 years, especially with lighter game, stews and aged cheeses. Lovely value at $16. The world's a big place and it seems that in most countries that offer a hospitable climate, wine is produced. Given that, it seems that every six months or so, we're hearing about a new wine region that has become an overnight success, despite the fact the growers and producers have been at this for a few decades (or centuries, in some cases). The latest collection of wines I was introduced to quite recently were those from Croatia. This country, located near the Adriatic Sea, a bit east of Italy and west of Serbia, enjoys a continental climate where summers are warm and winters are cold, much like certain wine zones of northern Italy as well as parts of France. To date, the best known thing about the wines of Croatia has been the Plavac Mali grape, originally thought to be a descendant of the Zinfandel grape, but is in reality a cross between Zinfandel and the Croatian indigenous variety Dobričić. Despite this, the white wines were the ones that most impressed me at the tasting of the newest releases from two of the country's best producers, Matosevic and Saints Hills. The mix here was both indigenous and international varieties, but the stylings were very European in their manner, with an eye on the latest technology in the cellar. 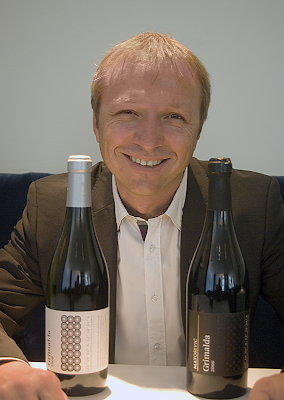 Matosevic also has a white blend known as Grimalda ($28), a blend of Chardonnay, Sauvignon Blanc and Malvasia. The wine was aged for one year in barrique and one year in stainless steel and displays aromas of spiced pear and anise and is quite rich on the palate. Nicely balanced, this has good acidity and a full finish; enjoy this over the next 2-3 years with most pork or most seafood. The finest white at this tasting was from Ernest Tolj of Saints Hills, who showed his 2009 Nevina, a blend of Malvasia and Chardonnay. Sporting aromas of chamomile tea and dried pear, this is a powerful white that explodes on the palate and has a long, long finish with distinct minerality. This is an impressive wine that compares to the finest blended whites of Friuli and is nicely priced between $30-$35. This needs strong seafood with a rich sauce - perhaps scallops with ginger or swordfish with rosemary. There were two reds sampled at this event: the Matosevic Grimalda Red and the Saints Hills Dingac. The former, a blend of Merlot and Terano, has aromas of black plum and anise and is medium-full with good acidity and elegant tannins. There is delicate spice, but this is a fruit-driven wine with subdued wood notes. Enjoy this over the next 5-7 years with most red meats ($30). The latter is made from Plavac Mali and is a more powerful red with big spice (somewhat reminiscent of a Barbera from Piemonte), good acidity and plenty of black plum fruit. This definitely needs game or grilled red meat to accompany it and it will have its fans. I enjoyed the wine and think it will drink well over the next 5-7 years - it will need a few years to settle down - but I found it lacked some finesse and elegance. Perhaps with time, that will come. The suggested retail price of $54-$60 seems a bit high to me and will make this a difficult sell. So my first encounter with the wines of Croatia was quite enjoyable. The wines are not only well made, but offer beautiful complexity and best of all, a sense of place; these are clearly not made to garner points in a wine magazine, but are meant to be enjoyed at the table with food. These producers have their priorities straight and I look forward to sampling more wines from Croatia very soon. P.S. One final note. This was a small event at Tru Restaurant in Chicago with lovely foodstuffs to accompany the wines. I was able to meet the two vintners and ask them questions. They were very helpful in helping me learn about their particular wines, so overall I was happy with the event. But I'd love to learn a lot more about Croatia and I think all of us would. Many people don't know where the country is, much less the wine zones, so a bit more information, such as maps or a guide to the varieties used in Croatia would have been of great value. Hopefully Wines of Croatia will be able to organize some bigger tastings in the future with more producers and perhaps even a seminar on this country's viticulture. The wines are the first step in education and they were wonderful this day. Now there needs to be more input on the part of Wines of Croatia if they are to get a foothold in the country. As I wrote at the outset, there are wines from all over the world, so to sell your products, you have to tell people about them. Recently some of the top golfers of the past 25 years have decided to come out with their own label of premium wines. While there have been a few ordinary wines, most of these projects have been quite impressive, especially the wines from South African Ernie Els (one of the nicest guys in the game) and his partner Jean Englebrecht. 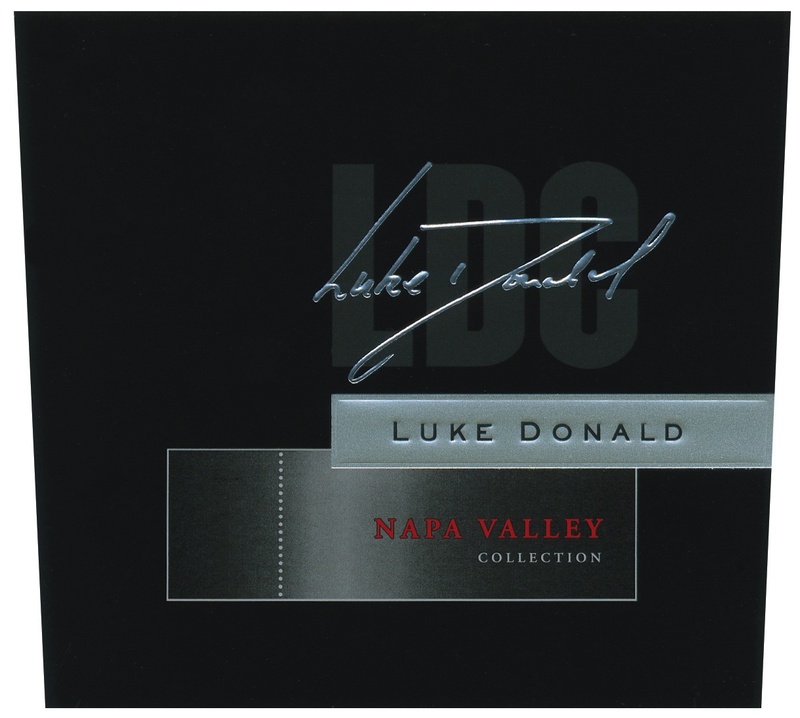 I'd like to recommend the wines from two relatively new projects: Jack Nicklaus Wines and the Luke Donald Collection. As anyone who knows an inkling about golf realizes, Jack Nicklaus was arguably the most successful golfer of all time, winning a record 18 majors. He certainly has one of the three of four most recognizable names in the history of golf and was truly one of the great athletes of the 20th century. Donald has enjoyed some wonderful success as well on the links and finished 2nd in the 2010 FedEx Cup, just missing out on a $10 million bonus (though he'll be in good shape with the $3 millon runner-up award). At 32 years of age (33 in December), he's #8 in the world golf rankings and has made a tremendous comeback after a serious wrist injury just two years ago. The future, needless to say, looks bright for Donald on the course. He's done pretty well also with his wines and the story of how his label originated is a fascinating one. A native Brit, Donald went to Northwestern University in Evanston, just north of Chicago and enjoyed great success there, winning the NCAA Championship individual honors in 1999. His coach was Pat Goss, who also was friends with Bill Terlato of the Terlato Wine Group in north suburban Lake Bluff. Terlato owned two Napa Valley wineries at the time, so after the Donald-Terlato friendship was formed, the golfer (Donald, that is!) was able to work with the Terlato family on producing a wine from Napa grapes. As Donald played in a lot of events in Europe, he had acquired a taste for great wines and he was allowed to sample blends and put his approval stamp on the finished product. 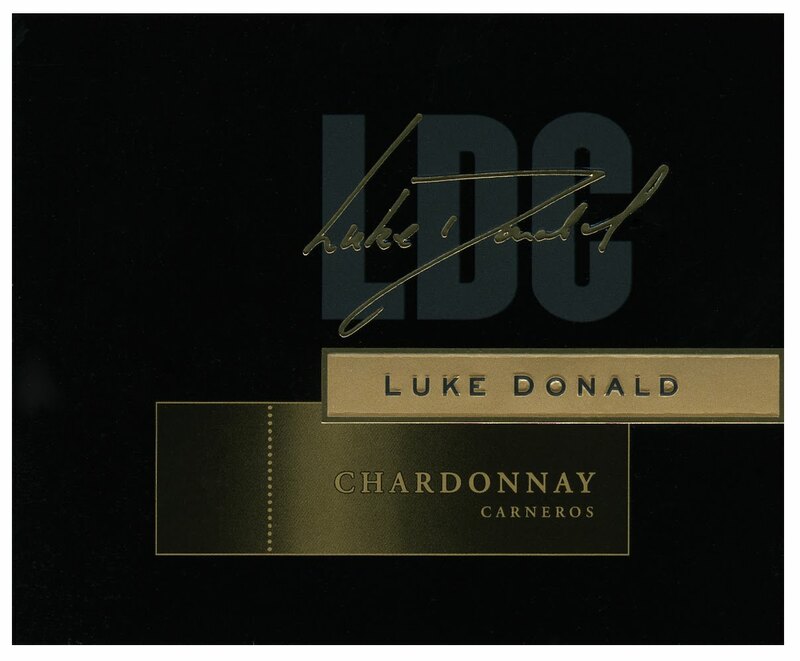 I recently tasted the two newest releases of the Luke Donald Collection: the 2008 Chardonnay from Carneros and the 2006 Claret. Briefly, the Chardonnay is quite rich with aromas of baked apples, saffron and orange and has good weight on the palate and very good persistence in the finish. The oak is admirably handled and as the grapes were sourced from the cool Carneros zone in southern Napa, the acidity keeps everything in balance. I'd love to taste this over the next 2-3 years with lobster, swordfish or most rich seafood or even pork or veal. At $30, this is worth every penny (this is very limited - only 900 cases produced) and if I had a seafood restaurant or was buying wine for a country club, it would be on my list. 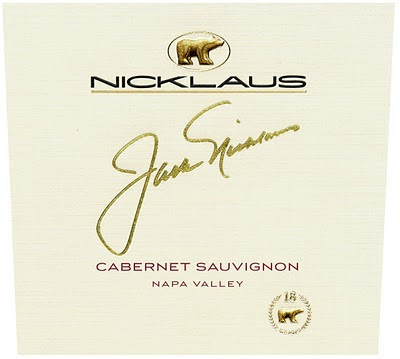 Back to Luke Donald in a bit, but a few words on the Jack Nicklaus Cabernet Sauvignon 2007 from Napa Valley. This wine along with the Private Reserve, which I didn't get a chance to try (next time, my friends at Terlato? ), was first sampled at St. Andrews Golf Course in Scotland earlier this spring and then in this country in May at the Memorial Tournament, run by Nicklaus in Columbus, Ohio. The 2007 Cabernet Sauvignon is instantly recognizable as Napa Valley Cab with its black cherry and plum aromas; add to that the medium-rich palate, round tannins and balanced acidity and you've got a real crowd pleaser. This is a wine that will drink well for the next 3-5 years, but it's instantly appealing now and would be a natural partner with any red meat. 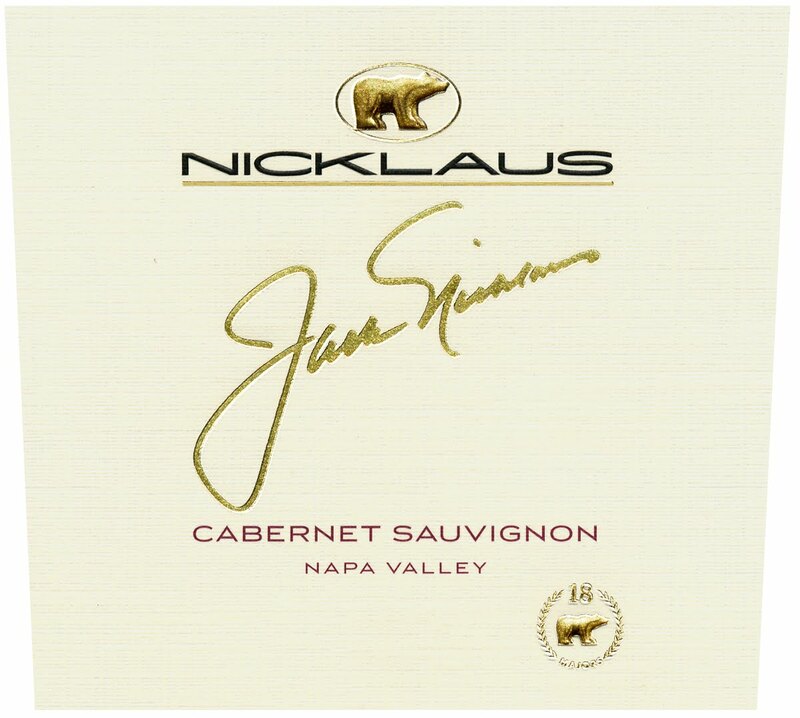 Again, if I were buying wines for a steakhouse list, this would be a no-brainer - how could you miss with an elegant Napa Valley Cabernet Sauvignon with the Jack Nicklaus name? This 100% Napa Valley Cabernet Sauvignon is value priced at $35 and based on this wine, I can't wait to taste the next offering of the Reserve Cabernet. 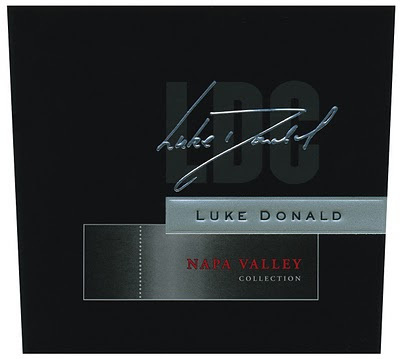 Saving the best for last, we have the 2006 Luke Donald Collection Claret. This is a blend of 44% Merlot, 43% Cabernet Sauvignon, 12% Cabernet Franc and 1% Petit Verdot. It's quite rich on the palate and features enticing aromas of currant, cassis and crushed rose petals. This is a beautifully balanced wine with very good acidity, which is not always the case with too many of today's Napa Valley reds. The oak is very well integrated and the wine has the stuffing to age gracefully for 7-10 years, perhaps even longer. The price on this is a very fair $40 (almost a steal for a Napa Valley wine of this quality these days) and while it would pair beautifully with steak, this would also work well with game birds and brisket, as this has more spice and earthiness as compared to the Nicklaus bottling. How nice to taste a complex Napa Valley red that is more in a Bordeaux style than the super ripe international approach so prevalent these days! How nice also that this wine is styled with the thought of cellaring in mind. As a closing thought, I'm not sure what I'd treasure more, a mixed case of the Luke Donald wines or a putting tip from Luke himself! Luke, I do live in Chicago, so I'm not far away!